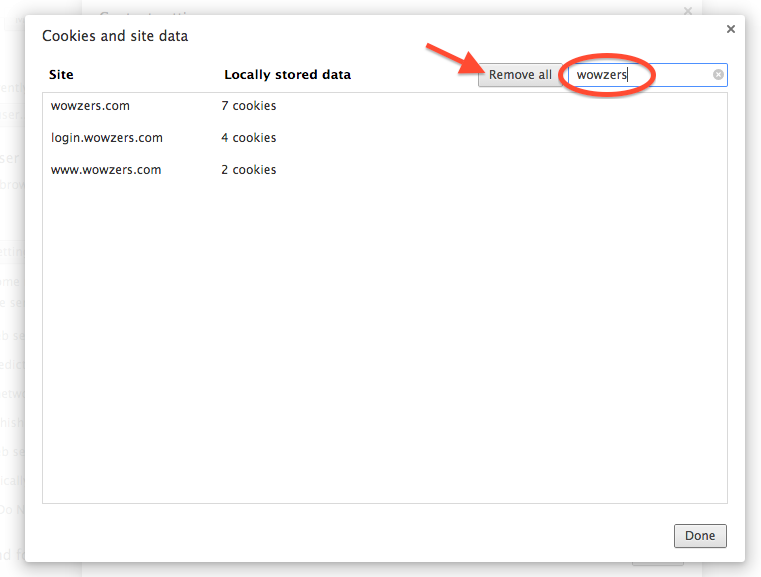 A redirect loop is usually a problem with the cookie that was saved from your last session using Wowzers. All you need to do is delete the cookie. 2) Then make sure "Settings" is selected on the left side of the page, and click "See Advanced Options" at the bottom. 3) The next section that becomes visible has the heading Privacy. Click the "Content Settings" button below that heading. 4) This will open a window. Click the button that says "All cookies and site data". 5) This will open a list of all the cookies your browser has stored. Type "wowzers" in the search box at the top to find cookies just from wowzers sites. Then click "Remove All" to delete those cookies. You can now close the these windows and the Settings tab, and return to login.wowzers.com. The redirect error should be cleared.